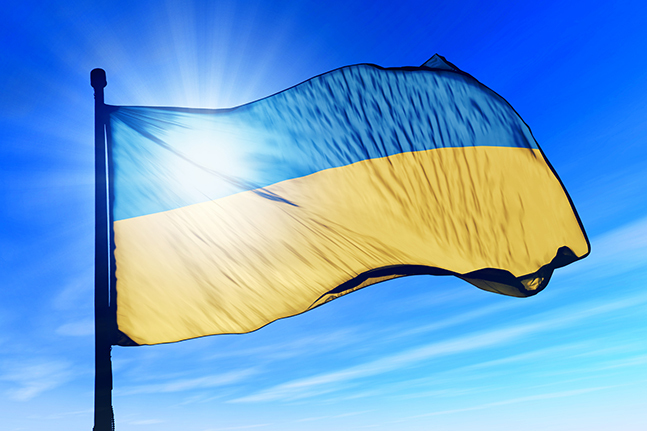 Does war impact amateur radio activity in Ukraine? PACC 2015: again we improved our own top score! Adrian is operating his new Kenwood TS-590SG during the PACC contest 2015. Another PACC contest for me and Adrian PA0RDA. This year we participated in the D1 multi-operator two-transmitter class for the first time. We did a very good job, we improved our own score, again, which is always our main goal (besides having fun). 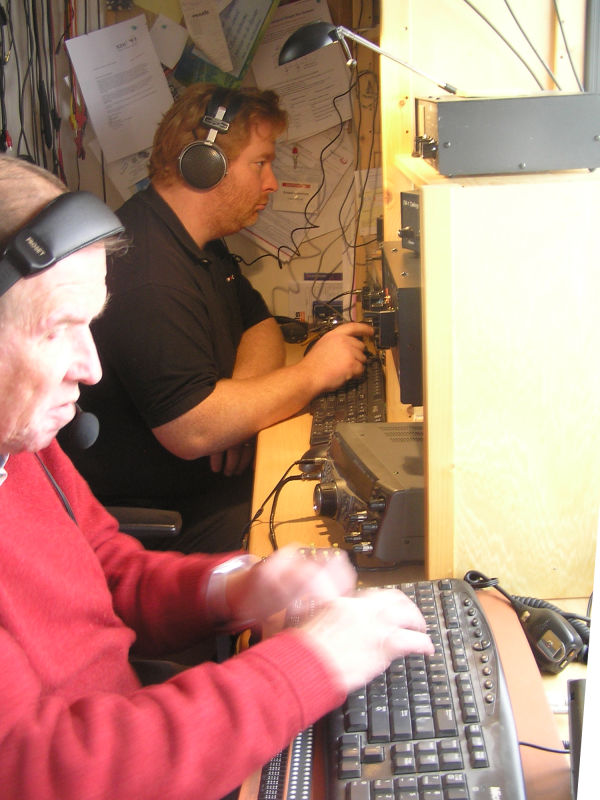 The weather conditions were rather poor again, we had lots of wind during the contest. Luckely all our antennas survived this time, even with a really strong gust of 40 m/s! All antennas are in place already for the 2014 PACC contest. 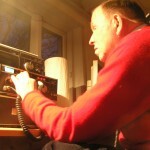 Meanwhile they allow me to work HF bands during the Winter season. 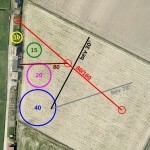 Last year the field was in such a bad shape, that we were not able to setup the half extended double zepp for 80 and 160m. This year we had some nice weather in November, allowing us to get all antennas up in a rather short time. We get used on erecting all those poles, since we do this at least twice a year: at the start of the winter and at the REC fielddays in June. Except the HEDZ, all antennas can be setup by one single person. My 2013/2014 antenna setup for HF: monoband verticals for 10, 15, 20 and 40m; HEDZ dualband antenna for 80 and 160m. Since Adrian PA0RDA was ill during the contest weekend, and we were not able to setup all antennas due to poor condition of the field, we decided to skip the PACC contest. However, on Sunday morning I could not resist to give away some points, so I made a bunch of CW QSO’s on 15m. We hope for more luck in 2014. The PACC 2012 contest was a great success for us, we doubled our score of last year! Our claim: 843 QSOs x 153 multipliers = 128979 points. December was a very windy month. 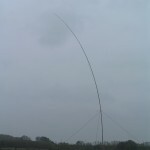 Most antennas did held, however the fibreglass pole of the 20m vertical broke. We contacted the supplier (DX-Wire, Germany) and luckely spare tubes were available for a few euro’s. So we ordered a replacement tube, and also ordered 2 more masts for future use. We were not able to do lots of testing on the antennas, since work lasted too much time. So that has to wait for the next month. November starts with 2 weeks of mild weather, with lots of sunshine and no rain. This means that the corn field is rather dry now and easy to walk on. In the first weekend I put lots of tonkin poles in the ground to mark all antennas. 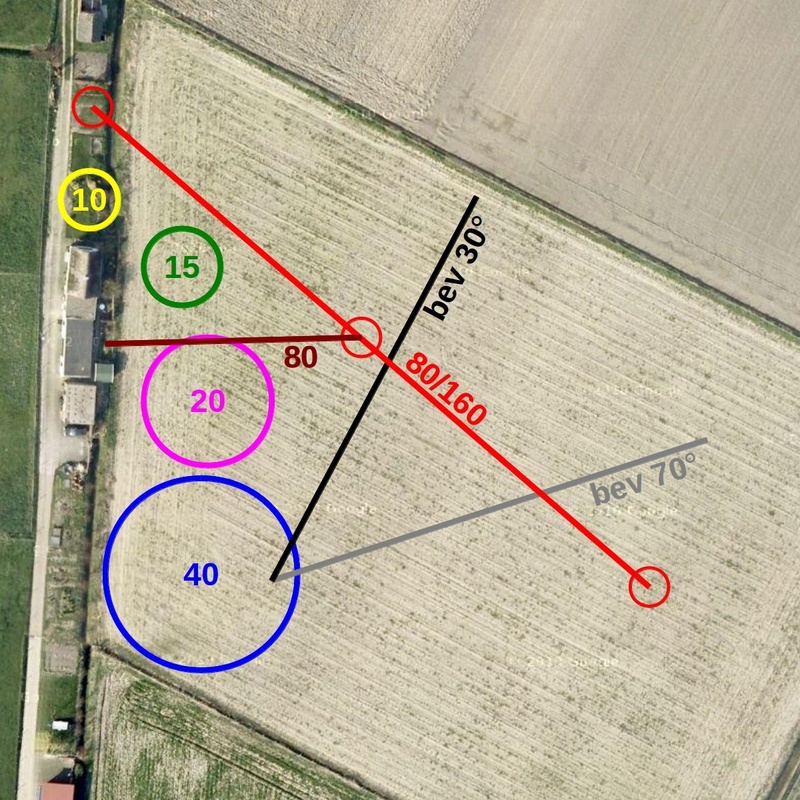 I also rolled out the HEDZ (100m) and the beverages (2x 80m). The beverage is nearly ready already, including matchbox and feeder. Wytske helped me to erect the 15m center pole of the HEDZ. Within a couple of hours a kestrel already liked the pole and is now regularly seen sitting on the top. We had some nice weather in the last weekend of October, so I went into the corn field to do some long walks: setting up the new beverages (length: 80m each) and the HEDZ. We bought some new, higher poles this summer for the HEDZ, the center pole will be almost 15m tall now. The poles are not erected yet, but I was on my own that weekend while I need 2 or 3 people to get the poles up. What are the plans for PACC 2012? 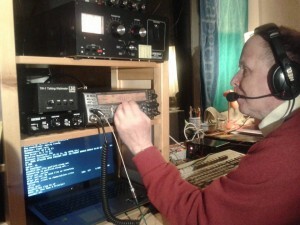 Well, we will set up all antennas of 2011 and add some new ones. We built 2 beverages during the REC fielddays, which will be used in the contest now. And we will build a small array of verticals for 10m, since it will be likely to have some propagation on that band during the contest. The first weekend of February was really windy. The rough wind ruined the just finished HEDZ, and nearly nocked down the other antennas. And there was nothing I could do, since I was suffering from influenza. I recovered during the next days, and on Friday (just one day before the start of the contest) Adri PA0RDA helped me to fix the antennas. The main pole of the HEDZ was broken, but luckely it was easy to repair. We checked all pins and guys, measured all the antennas, resoldered an inductor in the 40m matchbox, etc. In the afternoon the antennas were in top condition again, so we could start rebuilding the shack. 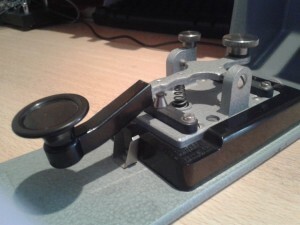 Thanks to a interesting article about the so called Half Extended Double Zepp (HEDZ) by W5DXP we managed to get our EDZ working om both 80m and 160m. The antenna is working fine now on 80m. I couldn’t test in on 160m yet, because my own rig (IC-730) doesn’t work on that band, but the measurements with the MiniVNA show a acceptable SWR between 1800 and 2000 kHz. When breaking up we will do some physical measurements to see what the exact size of the dipole and feeder is. The (H)EDZ is also a little bit lifted now, the center is 12 meters above the ground, the endpoints 8 meters. We also erected the remaining antennas: the 1/4 wave vertical for 40m, and the HyGain AV-12AVQ for 10/15/20m. 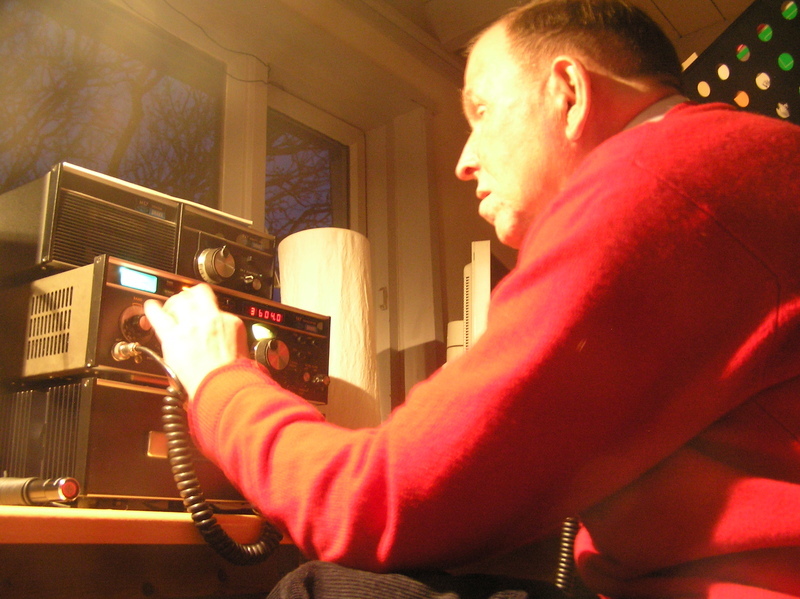 In the upcoming weeks we will extend the number of radials for the 40m vertical. Setting up antennas on a corn field is not really easy. Ok, there’s no corn in the winter, but the field is very wet and muddy. When the temperature drops below zero, the field becomes icy, and above zero the amount of mud under your (wooden) shoes grows with every step. 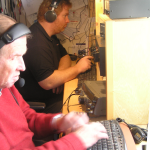 In 2009 we built an extended double zepp (EDZ) for 80m, which also performed really nice on 160m. Although the antenna performed well in the past contests, it was always a big trouble to match it. After lots of experiments and measurements, we finally found an unexpected relation between the length of the feeder and the “resonance” frequency. Ok, this antenna is not resonant on the desired working frequency, it only provides a workable impedance and very well radiation at some point. I always thought that this point was merely depending on the length of the dipole, and that the length of the transmission line merely influenced the impedance. Well, not for the EDZ! It is a non-resonant antenna, and all sizes do matter! So this makes the antenna a bit more complex, compared to a simple halfwave dipole. We found some websites stating that the length of the feeder line should be about 48 degrees, so 48/360 wavelength. We want to have a 80m EDZ, center frequency at 3700kHz (= 81.08 meters), so the length of the feeder line will be 81.08 x 48 / 360 = 10.81 meters. This is not a practical length, since the shack is not right beneath the antenna. So we add 1/2 wavelength feedline, resulting in a total length of 10.81 + (81.08 / 2) = 51.35 meters. Setting up the EDZ took quite some time. We had to options: the weekend of 4/5 December, or the weekend of 11/12 December. The first weekend would be freezing cold, the second weekend really wet. Since the cornfield is almost inaccessible when really wet, we decided to go for the first weekend. With the snow hitting in our face, ice hidden below the fresh snow, and a really cold wind, we managed to set up the EDZ. But due to the bad weather and ground surface conditions it took us lots of time, so we did not manage to get the feeder in the correct length. Two weeks later, the dipole came down due to the large amount of ice. So there is still some work to do on the EDZ….. Thanks to a local farmer we are allowed to use the corn field during the winter season. So during autumn it’s always a nice moment when the corn is being harvested. First we get some view to the east again, since the wall of corn next to the house is gone. But more interesting is the fact that this is the beginning of setting up the antenna’s for the yearly PACC contest. To prepare for the 2011 PACC, we did quite some work on our antennas. 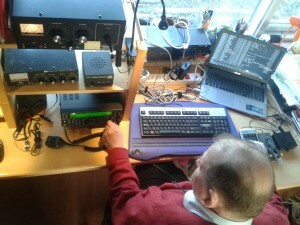 During the fielddays of our local radio club we focussed on the extended double zepp, which was hard to tune. so we played arround with the length of the feedline and performed measurements using the MiniVNA. We concluded that the antenna was too long, we will shorten it when setting it up for the PACC. We also completely revised the Hy-Gain 12AVQ (originally built in 1970! ), which was our only antenna for 10, 15 and 20m so far. All plastic parts were replaced, dirt was removed, new stainless steel bolts, nuts, washers and clamps, new tuned radials (the shorther ones extended with ropes to get the right corner), etc. We retuned the antenna using my MiniVNA. The antenna is now ready to be used again for many years. 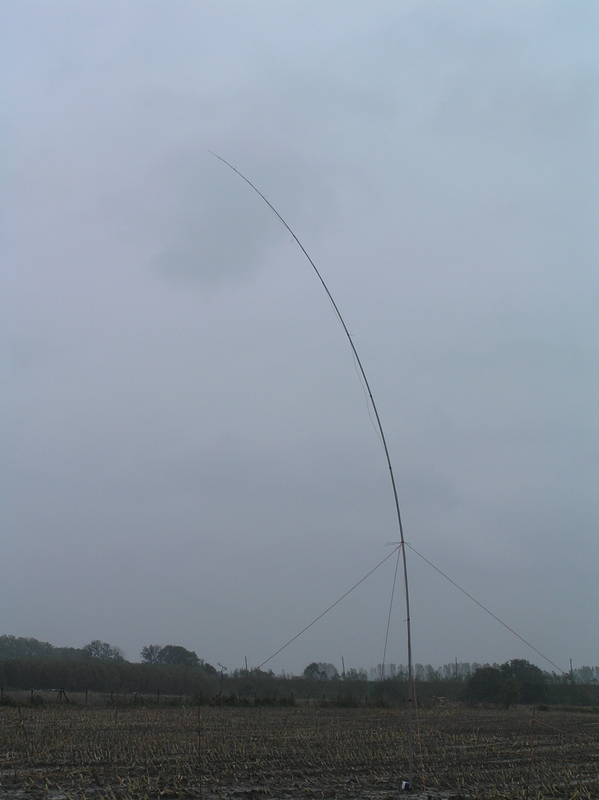 During autumn we built a 5/8 wave vertical for 20m. More activity on the higher bands is to be expected due to more geomagnetic activity of the sun. Therefore we need more antenna’s on 10/15/20m, also because we want to start using a multiplier station this time. Being on the air with 2 transceivers also requires proper filtering, so we started building RF filters (design K1TTT).